In September of 1969, the Cessna Aircraft Company launched a series of CE500 jets starting with the Citation I (CE-500). The FAA certified the Citation I jet in 1971, two years after the first flight of the aircraft. This jet was one of the first economic aircrafts targeted to the Owner Pilot. 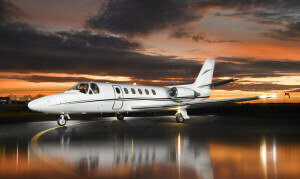 The Citation I, a small and fuel-efficient jet, was the first business jet to be certified by the FAA under the “Single Pilot Exemption”, which solidified the Cessna CE-500 jet series’ impact on the business jet market. The Cessna CE-500 jet series focuses on more docile handling features, to cater towards the owner pilot, rather than the aggressive handling characteristics of fighter jets. The last Cessna Citation series jet to be covered under the CE-500 type rating was the Citation Encore+, which is no longer in production. The Cessna Citation Series jets vary in weight and length, but all provide a comfortable and insulated cabin. From the cockpit, pilots are able to adjust the plane’s atmospheric settings. Additionally all jets come equipped with some sort of cabinets or storage containers within the cabin. So you want to receive legacy training on the Cessna Citation series, but where do you go? Premier Jet Training (PJT), based in Stuart, Florida, offers an initial five-day course consisting of classroom ground school, flight simulators and flight training conducted in either your own or a PJT owned aircraft. You can enroll in content specific courses covering certifications for Pilot in Command, Second in Command or upgrade training from SIC to PIC. If you are in need of a refresher course, those are also easily available. Recurrent training can take anywhere from three to five days to complete. Similar to the initial certification courses, the recurrent training will include a written exam, simulator sessions and a final proficiency aircraft flight. The simulator sessions for this training can be suited to your needs. You can purchase or lease a Cessna Citation Series jet, but the price varies depending on the model and condition (pre-owned or new) of the aircraft you want to buy. Prev:How Many Years Does It Take To Study Aviation?